Amazing Thailand - Maeklong - the market on the railway track. Click here. A direct non-stop Express Train that takes 15 minutes from the City Air Terminal (Makkasan) train station to the airport. This service connects to the city's mass transit subway system at Makkasan (Phetchaburi station for MRT (subway) Blue line). Passengers will have the opportunity of checking in their luggage at the City Air Terminal, before boarding the express train to Suvarnabhumi airport. The fare is Bt150 per trip. 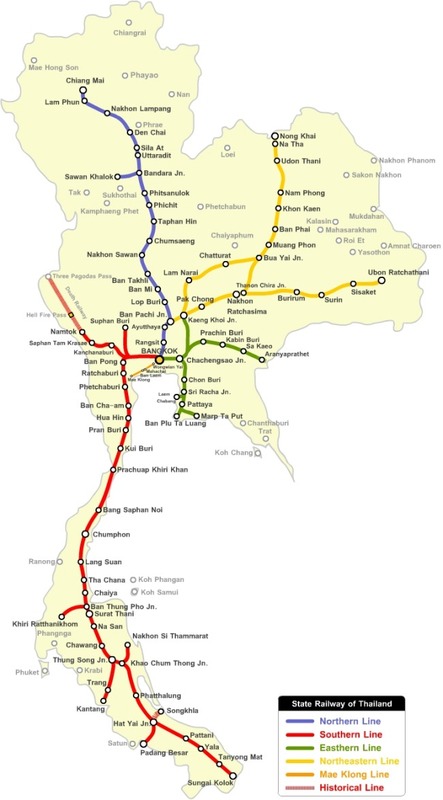 The Commuter Citylink Train makes eight stops throughout the city, taking 30 minutes to travel the 28 kilometers (17 miles) to the airport and linking with both the *Subway and **Skytrain systems in Bangkok. (at Makkasan (Phetchaburi station for MRT (subway) Blue line), and Phayathai Station for BTS Sukhumvit line (skytrain)). The fares are Bt15 - Bt45. The Bus Link is available for transfer passangers and departs from Gate 3 Level 2 at Suvarnabhumi Airport. The frequency is 12 or 30 minutes between 05.00 hrs to 24.00 hrs. The journey time is approx. 1 hour. Suvarnabhumi Airport is the new international (and very limited domestic) airport serving Bangkok, Thailand. The airport is located 25 kilometers east of Bangkok, in Racha Thewa in Bang Phli district, Samut Prakan Province. The name Suvarnabhumi (pronounced su-wan-na-poom) means "the golden land", specifically referring to the continental Indochina. The 324 sq km plot of land occupied by the airport was originally purchased in 1973 but, due to a variety of economic and political reasons, the project was continually delayed. Recent former Prime Minister Thaksin Shinawatra is often accredited with insisting on the final completion and opening of the airport. The project was a personal crusade for Thaksin Shinawatra, who once camped out on the building site to show his support. The construction of the City Airport Terminal in Makkasan and a 28.6 km high-speed rail link to the new airport started in July 2005 and are planned for completion in November 2007 (but more likely sometime in 2009). This airport express train service (informally known as the Pink Line) will connect with the BTS Sukhumvit Line and MRT Blue Line at Phaya Thai and Phetchaburi stations respectively, offering airport-bound passengers a fast 15-minute limited stop journey from the city. Internally the airport itself is a concrete and steel affair, and if you enjoy a lot of walking, this is the airport for you. As indicated below, the airport is a long way from town - the proposed Pink Line train service will help tremendously in this respect. It is a 60 minute drive (at least) to the airport from central Bangkok. Also note that after clearing immigration (20 minutes), it can take 15 minutes to the furthest domestic gate and 30 minutes to the furthest international gate. Allow plenty of time (minimum 3 hours) when departing your hotel in central Bangkok. This is not an airport for which you can cut your timing a bit fine. The check-in desks also close early (due to the time required to clear immigration and walk to the gates). However, if you are fortunate enough to stay at either the Shangri-La or The Peninsula hotels, then the fastest way to the airport is by helicopter from their own helipad. It has been reported that this service (especially from the Shangri-La hotel) is available to anyone who has US$ 200 to spend. Although maybe initially confusing, and not withstanding the signs, notice the symmetric layout. Concourses A,B,C and E,F,G are connected by the long concourse D. Essentially, in one dimension, in front of concourse D are all the check-in desks and immigration. There are two 'Thai houses' on the top (4th) floor at the junctions of A,B,C and E,F,G concourses. Having cleared immigration, or on transfer/arrival, these two Thai houses are good meeting points and a place to get your bearings. There are two transfer desks (on the 2nd floor) directly below the two Thai houses. The transfer desks only serve specific airlines. If you are at the wrong transfer desk, then you have a long walk down concourse D to the other transfer desk. At the Thai houses, you can easily descend to level 3 (departures) and level 2 (arrivals/transfer desks/tiny smoking rooms/toilets). The Public Transportation Centre is a 28-rai (42,000 sqm) space located near the Bangkok Catering Company building about 5 minutes (4 km) drive from the passenger terminal. It is dedicated to transportation via taxi, limousine, rented cars and buses. One can get to the Public Transportation Centre from the terminals via a shuttle bus at Level 2. However public taxis are now allowed to pick up at the outer curb on Level 1. Public buses run to and from several city destinations including Min-buri, Happy Land, Victory Monument, Bang Na, Samut Prakarn and Don Muang. Catch the public buses at the Airport Public Transportation Centre. This service has been terminated due to the new rail link. Until the new train airport link is completed in 2009, there is a cheap alternative at approx. 50 baht. The nearest railway station to the airport is at Hua Takhe which on the Eastern railway line network. There is an air-conditioned bus No 517 from the airport transportation centre to Hua Takhe railway station. The bus journey time is 15 minutes. The main problem however is that this bus service is reported to run every two hours now, due to poor publicity and lack of use - you may have to use a 80 baht taxi for this small sector. A suburban commuter train, operated by the State Railway of Thailand, runs from Bangkok Hua Lamphong station to Hua Takhe - journey time is about one hour. Stops include Don Muang, Phaya Thai (BTS connection) and Asoke (MRT Phetchaburi connection). The official hotel of Bangkok's new Suvarnabhumi International Airport is the four star Novotel Suvarnabhumi Airport Hotel, which opened on 1st September 2006. The Novotel have a courtesy bus every ten minutes (24 hrs per day) from Level 2 (arrivals level) at exit 4 gate. A footbridge connecting the hotel to the airport is not yet operational. However it is still possible to walk, in a few minutes, from the rear of the hotel to the airport ( level 1 ) via an underground car park. There is also a very comfortable two star budget hotel, Queen's Garden Resort, (US$ 30 per night), within five minutes ( 3 km ) of the airport. All other hotels are at least a 15 to 20 minute drive from the new airport. The nearest airport to Khao Lak is Phuket International Airport, situated in the north west of the Island of Phuket. The distance from the airport is 75km. Thai Airways International operates several direct flights each day throughout the year between Bangkok and Phuket. Flying time is one hour and twenty minutes. International travellers arriving in Bangkok, in transit, on Thai Airways flights may choose Phuket rather than Bangkok for Passport and Customs formalities. There are a couple of well known international car rental offices in the Phuket airport complex. Immediately opposite the exit perimeter gate, but set back, are three or four additional car rental offices some of which are friendly local (and quite often more economical) operations. Jeeps are quite popular. In addition there is a range of saloon cars and the occasional 4WD. There are of course numerous rental offices elsewhere throughout the island especially in the popular southerly and westerly resorts. Travelling to Khao Lak by road from Phuket, take route 402 heading north and proceed over the Sarasin land bridge into Phang-Nga province. Some 12km after the bridge at the village of Khok Kloi connect with route 4, heading north again, towards Takua Pa and Ranong (the easterly direction of route 4 goes to Phang-Nga town). Continue past Thai Muang and Thap Lamu, to Hat Khao Lak (at the village of Ban La-on). 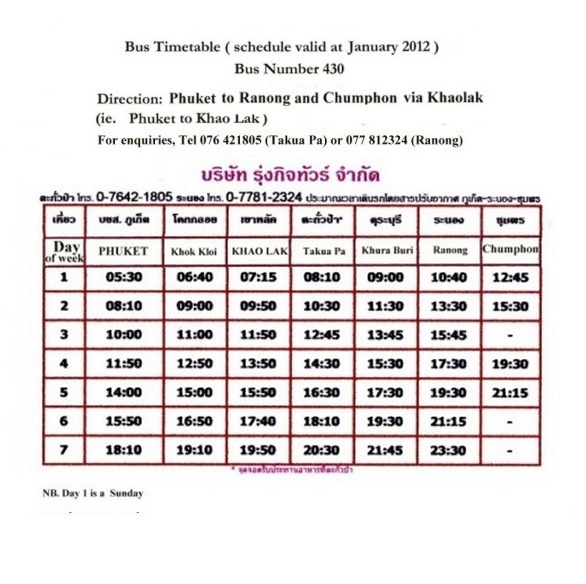 There is a regular bus service to Phang-Nga from Phuket Town bus terminus (just off Phang-Nga Road). Rather than proceeding all the way to Phang-Nga, ask to be set down at Khok Kloi, and then catch a bus heading north for Takua Pa or Ranong and alight at Ban La-on (Hat Khao Lak). Allow upto 90 minutes by car, and two hours by bus. There are one or two daily return flights from Ko Samui to Ko Phuket, operated by budget carrier Bangkok Airways. Then proceed by road from Phuket to Khao Lak. By road from Surat Thani, take route 401 heading west to Takua Pa which is a distance of 150 km. The route takes you past the spectacular Khao Sok National Park and Dam. At Takua Pa follow the coast due south on route 4, past Bang Sak to Hat Khao Lak. Thai Airways operates several flights per day from Bangkok to Phuket. Budget carriers Bangkok Airways, Thai AirAsia, and One-to-Go also operate daily flights each, between Bangkok and Phuket. Then proceed overland from Phuket. An interesting alternative would be to catch a train from Bangkok to Surat Thani. There is a good regular service from Hualomphong Station in Bangkok. There are various classes of seating available (price range approximately 200 baht to 1100 baht) but First class or 2nd class with air-con is recommended. Tickets may be purchased in advance. The journey time can take 12 hours. An overnight sleeper service is also available, arriving in the early morning at Surat Thani. info@srt.or.th www.srt.or.th Proceed overland from Surat Thani. Alternatively, there are flights from Surat Thani to Phuket (Tel: Air Andaman in Phuket +66 76 351374-5); then proceed the much shorter distance by road from Phuket. Travelling by road from Bangkok, take Highway 4 (or Route 35 and then pick up Highway 4 north of Phetchaburi) passing through Phetchaburi, Prachuap Khiri Khan, Chumphon, Ranong on the west coast of peninsula Thailand, and on down to Takua Pa, still on Route 4. Khao Lak is a further 35kms. The road system is good and well sign-posted throughout. Journey time is roughly 13 hours for the 850km distance. There is a good regular daily inter-provincial bus service from Bangkok (southern bus terminal) to Phang-Nga (and Phuket). The VIP air-conditioned buses, or the Government 1st class air-con bus, are recommended. For example the VIP24 buses offer more leg room, having only 24 seats instead of the usual 36; they also have a TV and a toilet; they make one stop at a restaurant. VIP buses usually only leave early evening (approx 6pm) in both directions. Allow thirteen hours travel to Phang-Nga. The ordinary buses offer less comfort, although they do travel during daylight hours, usually departing early morning, but they can add upto two hours to the journey time. The two hour journey from Krabi to Khao Lak by road takes you entirely along route 4, through Phang-Nga town. At the village of Khok Kloi, route 4 heads north in the direction of Takua Pa and Ranong, following the peninsula western coast. Continue past Thai Muang to Khao Lak (Ban La-on). By bus, take the Phuket bus and change at Khok Kloi for a Takua Pa or Ranong bound bus, and then ask to be set down at Ban La-on. Advance Aviation opened a helipad in Phuket in January 2009 to cater for high-end tourists and business travellers. The operation serves clients in Phuket and surrounding provinces. The helipad, hanger and offices are located at Sakoo, Phuket on the old airport road about 2 km south of Phuket International airport. Flights only operate in daylight hours. A thirty minute trip typically costs around US$ 2,250. They use a EC130 model helicopter from Eurocopter - in VIP configuration with six passenger seats. This model is the quietest in its size class. The Eurocopter EC 130 is a single-engine, helicopter manufactured by the Eurocopter Group. Worldwide it is used amongst police and ambulance services, and for executive transport. It is equipped with the new starflex main Rotor for added strength and weight reduction. The EC130 features an enclosed tail fan rather than the traditional tail rotor. This has the advantage of reducing outside noise by 50% compared to a tail rotor. The max speed is 287 km/hr with a range of 610 km. Advance Aviation is one of three helicopter operators in Thailand, and is the only one that specifically caters for the VIP market. Thailand's only seaplane shuttle service opens on 1st February 2007. It is operated by Destination Air Shuttle, which, for convenience for connecting flights, has its HQ at Phuket International airport. It will carry passengers from locations along Andaman coastal areas from Ranong, Ko Phi Phi, Krabi, Ko Lanta, Khao Lak and Trang. Note that some routes are seasonal (high season only). Khaolak's bus station is located at Bang Niang (northern end, close to the Khaolak City hotel, and behind the water reservoir). Buses leave KhaoLak about every hour or so, in both directions - north and south - from approx 6.00am to 7.00 pm. (Conversely, the very long distance buses in Thailand typically travel through the night, rather than daytime). Buses stop at all stops by request - just flag them down. If you are out in the street rather than the bus terminus, note that the (blue) air-conditioned buses stop only if they still have any free seats or are pre-booked. It is advisable to book in advance. Motorbikes and cars, including the ever popular Suzuki Jeep, can be hired for getting around. The price usually drops, the longer the hire period. The only question is whether you prefer to rent a car at Phuket International airport, where the selection is greater - there are four or five car rental agencies immediately opposite the airport exit - or whether you rent one in Khao Lak. This may also depend on your arrival time, and confidence of directions. It may be possible for the Phuket airport car rental companies to deliver to KhaoLak (and you return it to the airport). Try to ensure that valid tax and insurance (remember the Thai year (eg 2008 AD is 2551 BE)) are displayed in the windscreen (the documents may be slightly folded either by accident or design). If you ever get stopped by the police and the documents are out of date, it may be better, to save time, to just pay the small on-the-spot fine (you will get a receipt but you can keep on driving for about seven days unchallenged) - otherwise the police will keep your license document (whichever one you prefer to give them) until the fine is paid (at the nearest police station to the point of stoppage - wherever that may be). In case of an accident, the law is biased towards Thais who hold an official Thai driving license. This is just the way it is - it is presumed that a local Thai is more familiar with the rules of the road than a visitor. Assuming the accident is not too serious, and despite the insurance document, you may sometimes have to consider paying a relatively small contribution towards damage and hospital expenses, but let the hotel negotiate on your behalf perhaps, to prevent any unreasonable claims. Alternatively, the most conveniant method of travelling around is by taxi trucks or Songtaews which are available for trip hire at all towns, and they can be hired for the entire day if needbe. The songthaew, which literally means, "two rows" is essentially a converted pickup truck and is named after the two parallel benches in the rear. The songthaew is used as a taxi or schoolbus. Local and inter-provincial buses are also an option for longer journeys; they operate over a wide network to almost any conceivable destination. And of course, for the short seafaring trips, such as to neighbouring beaches, small islands and the Coral Reef just off the coast, or boat trips up the scenic Khlong Thap Liang estuary, long-tail boats can be arranged by the resort hotels and local agents. In general buses more or less run to schedule and reach their destination roughly on time. The sometimes tricky part is trying to get hold of the timetable schedule in the first place. There are several bus companies and some of the ticket offices at the bus stations only promote their own company, and not those of other companies which may run at more frequent and convenient times. 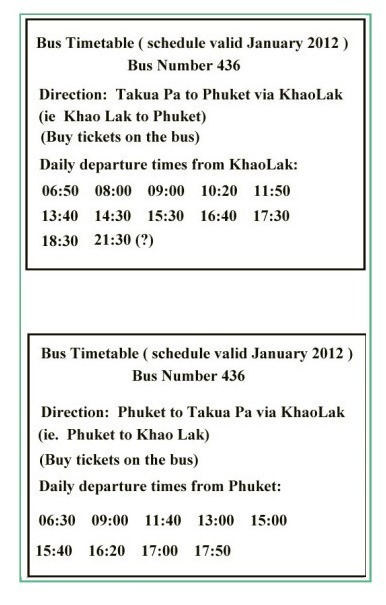 In addition it is sometimes possible to buy tickets on the bus (hence no need for a ticket office) - eg the 436 bus between Takua Pa, Khao Lak and Phuket. Armed with a pen and paper, try to find an overall help control desk at the bus station; they should have most of the times for all bus departures hand written somewhere, but be patient. Also, some of the bus drivers (eg the 436 bus again) easily memorise all departure times for the whole day ! 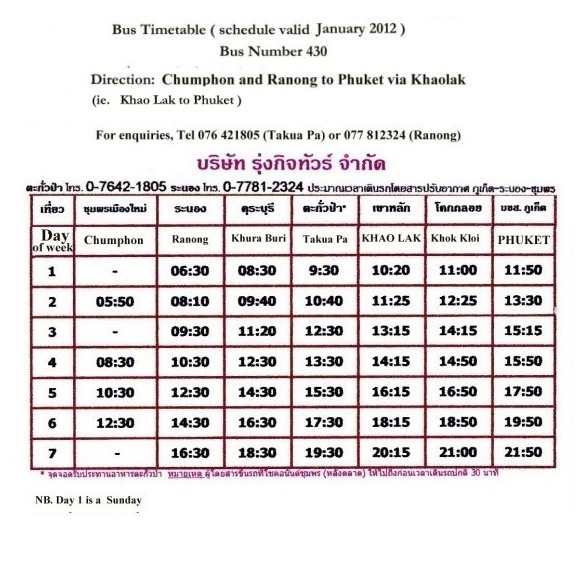 Bus 430 Chumphon, Ranong to Phuket via Khao Lak. Bus 753 Chumphon to Phuket via Khao Lak. It is mainly in Thai but in theory you can book some tickets on line. 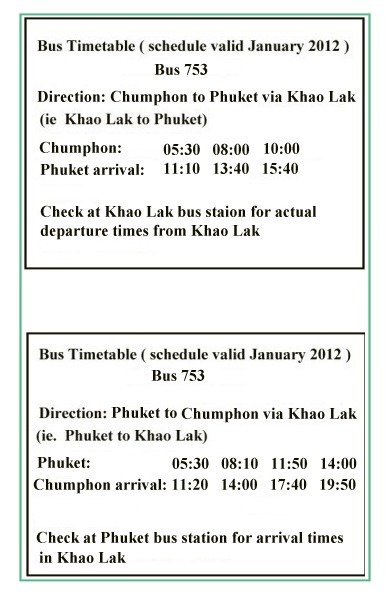 Note that these buses do not actually go to the airport in Phuket; the closest they go is about 5 km. Below are some timetables to give a few guidelines as to frequency. They may easily be subject to inaccuracies and changes!! Always try to visit the bus staion the day before departure to check the times, especially with regard to the last bus of the day for a particular service route.